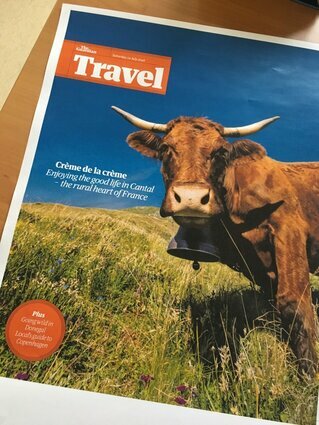 Dans une logique d’attirer plus encore de clientèles étrangères, Cantal Destination a accueilli en juin dernier le quotidien The Guardian pour un road trip dans le Cantal. The Guardian est l’un des principaux quotidiens anglais avec 180 000 exemplaires vendus par jour. Son site internet est l'un des plus lu au monde (il se classe au troisième rang des sites de presse les plus consultés du monde). Le site accueille 150 millions de visiteurs uniques par mois, dont les deux tiers viennent de l'étranger. "In central France, the Auvergne’s volcanic landscape offers year-round activity holidays, with peaks to climb, lakes to swim, restored farms to stay in and great value mountain cuisine. The Cantal is the rural heartland of France’s wild Auvergne region, right in the centre of the country and part of the Massif Central. Locals joke that there are more cows here than people and there certainly are not many tourists, despite a range of adventurous outdoor activities in summer and winter. Hotels and B&Bs could not be more reasonably priced, and the hearty regional cuisine – rustic rather than gourmet – comes in formidable four- or five-course bistro set menus, ideal for big appetites and small budgets. The Cantal also boasts some of the most spectacular sites in La Chaîne des Puys, the 80 or so extinct volcanoes that have just been recognised as a Unesco world heritage site. Extinct volcanoes, glacial valleys and lakes over 5 million years old form the remarkable Parc des Volcans, France’s largest natural park. Outdoor activities range from trekking and mountain biking along craters of cone-like volcanoes, hot-air ballooning, paragliding or horse riding (in winter, there’s downhill and cross-country skiing, and dog-sledding). The jewel in the Cantal’s crown is majestic Le Puy Mary, at 1,783 metres. Stop off at Auberge du Puy Mary for a slice of its famous tarte aux myrtilles, then trek via the Pas de Peyrol to the summit for breathtaking views and myriad wild flowers and plants. The grand, black-stone town of Saint-Flour perches atop a mass of volcanic magma petrified millions of years ago. Many buildings date from the middle ages, including a monumental twin-towered Gothic cathedral. The Saturday street market is perfect for stocking up on picnic goodies direct from local farmers. From Saint-Flour, explore the winding Truyère river, beginning at Gustave Eiffel’s iconic Garabit viaduct. As the Truyère weaves south, every turn reveals steep wooded gorges, tiny islands and vast lakes. Fishing and boating are the big pastimes. Cantal’s capital is well worth a day’s visit. It hosts a renowned international street theatre festival, which transforms the city into one huge open-air stage each August. As this is France’s unofficial umbrella capital, its attractive shops include the quaint boutique Parapluies d’Aurillac, as well as Crèmerie Leroux (15 rue Emile-Duclaux), an ancient dairy filled with pungent ageing cheeses, and Louis Couderc, offering free tastings of an artisan distillery’s liqueurs made from botanicals such as gentiane and verveine. Join the locals sitting on the terrace for an after-work aperitif at the lively Café de ma Mère(Place Claude Erignac). One of Les Plus Beaux Villages de France, Salers and its lava-stone mansions sit at the heart of the Parc des Volcans, surrounded by fields of cows – the distinctive red-fleeced, long-horn Salers breed, whose milk makes the famous eponymous cheese. From May to October, during the summer transhumance, it is possible to drive or hike up a rough mountain path from Col de Néronne to visit Buron d’Algour, where each afternoon Guy Chambon milks his cows and makes traditional Salers cheese straight afterwards in his spartan buron (shepherd’s hut). Château de la Trémolière, a short drive north, has a rare collection of exotic Aubusson tapestries, while medievalChâteau d’Anjony, to the south, is decorated with very well-preserved 16th-century frescoes. Chaudes-Aigues certainly lives up to its name, with a steaming river source bubbling up here at 32C (and reaching as high as 82C at the Par spring, making it the hottest natural water in Europe). Like many of France’s venerable spa towns, Chaudes-Aigues has moved with the times, transforming its medicinal “taking the waters” thermal baths into a Scandinavian-style, family-friendly wellness centre, where a €20 day pass gives access to jacuzzis, saunas, steam baths and multiple thermal pools, including one on the roof looking out over the surrounding mountains. South of the town is the wild, lunar terrain of the 1,200-metre Aubrac plateau. Pack a picnic and head off hiking across this bewitching landscape. The region’s principal ski station, Le Lioran, is a year-round resort, full of functional, purpose-built hotels and apartments, with rarely much of a queue for the télépherique. Once atop the slopes, explore Col de Prat de Bouc, a spectacular glacial pass that envelops the region’s highest volcanic peak, Le Plomb du Cantal, before wending your way back through pine forest to Le Lioran. Ten minutes’ drive away, Murat is a fortified, 14th-century town overshadowed by a towering basalt outcrop with a tiny chapel balanced on the pinnacle. There are often art exhibitions in the covered marketplace, and don’t miss Coutellerie Le Murat for exquisite handmade mountain knives".